The Society of Toxicologic Pathology (STP) Internet Committee-Web-based Education Subcommittee (WBEC) is pleased to offer these quarterly Short Education Webinar Series as an educational tool to foster collaboration among the toxicologic pathology community. The fifth of the series will focus on Impact on the Stage-Aware Assessment of the Reproductive Tract which features five presentations from a half-day Continuing Education Course at the STP Annual Symposium held in Montréal, Québec, Canada (June 2017). The evaluation of the reproductive system in the context of toxicological pathology requires a good understanding of the normal physiology and morphology of the reproductive organs. Stage-aware assessment of the reproductive organs can provide important information on the potential of toxicity of a compound in the early phases of the drug development. However, the reproductive organs undergo major morphological and physiological changes from birth to senescence, and therefore the interpretation of reproductive morphological alterations and/or pathology sometimes becomes complex. 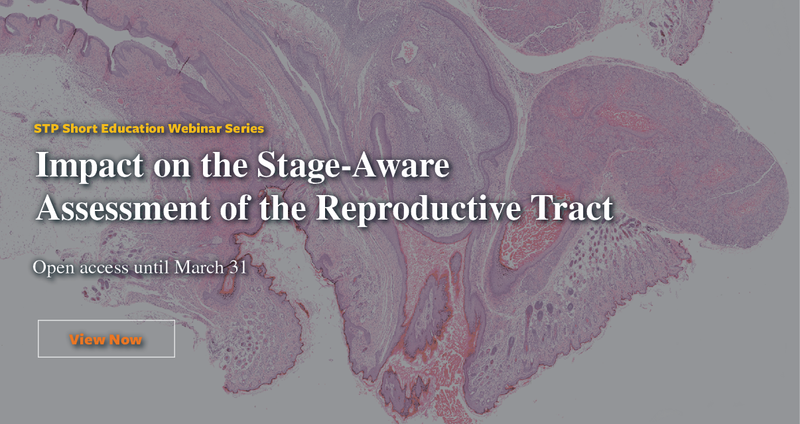 This interactive course presents different aspects of reproductive toxicological pathology that pathologists will face during the various phases of drug development, from challenges in juvenile and immature animals to changes associated with senescence, with emphasis on the stage-aware assessments of male and female reproductive organs in typical laboratory animal species (rodents, dogs, and NHP). Karen Regan, DVM, DACVP, DABT, Regan Path Tox Services, Inc. The affiliations of the presenters are those in effect at the date of the presentation. Copyright 2019 The ACT Member Network. All Rights Reserved All material, files, logos and trademarks within this site are properties of their respective organizations.